FISM award-winner Henry Evans is back to take you on a guided tour to the other side of illusion – where the impossible becomes possible and wonderful, surprising and often humorous things happen. 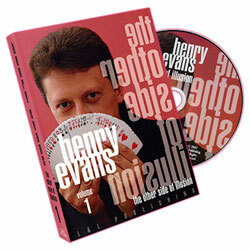 If you enjoyed his last critically-acclaimed DVD offering, Something More Than An Illusion, you’ve already had a glimpse into the whimsical world of Henry Evans. If you haven’t, you’re in for a rare treat indeed. Impossible Control 1 – Regardless of how many card discoveries you already know, you’ve never seen one like this! A selected card is found by the performer in a humorous way under impossible circumstances. The spectators shuffle and the performer never sees any cards until the revelation! Impossible Control 2 – Another jaw-dropping card discovery as the performer finds a selected card returned to a random position in the deck at the position named by the spectator himself! Memorized Deck – A two-deck stunner that will absolutely convince your audience that you can memorize a complete deck of cards in seconds in order to locate a selected card. You’ll also learn some great lessons on how to add humor and build suspense in an effect. Quit Smoking – A very funny and unexpected effect as the performer produces a long stream of soap bubbles from the end of a cigarette in addition to a twenty-dollar bill. At the end, the cigarette vanishes completely! Impossible Cards Transposition – You’ll be rubbing your eyes as you watch the backs of two selected cards change colors and are subsequently found in an opposite-colored deck that was in plain sight. The Cards Expert – An amazing demonstration of card dexterity and control. The performer cuts to the four Aces and the four Kings. He then cuts to only red black cards and then to only black cards. He then cuts to alternating red and black cards. For the impossible finish, after a thorough shuffle, the colors completely separate. Chinese Economy – A wildly visual routine as large Chinese coins vanish, reappear and multiply with absolutely no cover. Four Forever – A stand-up version of Chinese Economy, ideal for walk-around situations with a climax that features the magic happening right in the spectator’s hands. Matching Couples – The performer removes the picture cards from the deck and, after they are shown to be mismatched, they magically rearrange themselves by value and suit. For the unbelievable ending, the deck is continually shuffled by the spectator yet the rest of the deck manages to rearrange itself into matching pairs. Needle Through Deck – The performer pushes a large, threaded needle through a playing card box. Not an impressive feat until the cards are removed and found to have no holes or any other evidence of the needle and thread passing through them. The perfect opener! Risky Bet – A packet of cards is shuffled by the spectators as the performer places some paper currency into a glass as a bet against failure. The cards are divided into small piles and one is freely chosen. When the value of the cards in the selected packet are added, they are found to match the amount of money in the glass. Dollar And Quarter – You won’t believe your eyes as a borrowed quarter and dollar bill are visibly fused together to form one of the strangest objects your audience is ever likely to see. The two components are then magically separated and returned to their owners! Flipper Card – A selected card visibly vanishes from between two Queens and is found in the card box which has been in plain sight. One of the most visual card effects you’re ever likely to see! New K.O. Rope – The performer cuts a length of rope into two pieces and then restores them but that is just the beginning of a startling sequence of magical events. Without any further cutting, the rope becomes two lengths again and then suddenly multiplies into three and then four lengths. The performer then restores it back to two and then back to one. For the surprising ending, the rope is in four lengths again and each is handed out for thorough examination. Mental Power – The performer correctly divines a spectator’s thought-of card and then subsequently shows that the spectator had no other choice as every other card in the deck is now blank! Keen Sense Of Touch – Another impossible location as the performer finds two signed cards in a deck shuffled by the audience in a transparent bag while his eyes are covered. A great stand-up card effect for any size audience! Finding The Aces – Imagine being able to locate the four Aces in an instant from a deck that’s been completely shuffled by the spectators. A very practical method for an utterly impossible effect. Ten Exact Cuts – The full details of Henry’s masterpiece, the finale of his FISM act, finally revealed! The performer cuts a deck of cards into ten packets in just a few seconds and then shows one card in the first pack, two in the second and so on to the tenth. For the dumbfounding finish, the deck is shuffled and cut into three packets which are shown to be the three remaining suits – in exact numerical order!